Earlier this month, Matt and I celebrated our anniversary at a Japanese kaiseki dinner. Everything was beautiful and most of the dishes were things I wouldn’t even know where to start making at home. There was one thing I did want to try myself though, pickled apples. They were served to us as a palette cleanser after a course of grilled fish. My first thought was that they’d be wonderful on bbq pork tacos and they were! We buy pork shoulders and slow cook them with different sauces until they are tender enough to be pulled. Then we divide it into dinner size portions to use in tacos, sandwiches, or just on rice. The sauces vary from Asian-styles to classic bbq. This batch was cooked with Wee Willy’s Texas Pit sauce, it’s one of my favorite bbq sauces we’ve tried. Once the pork is prepared dinner is quick to prepare. 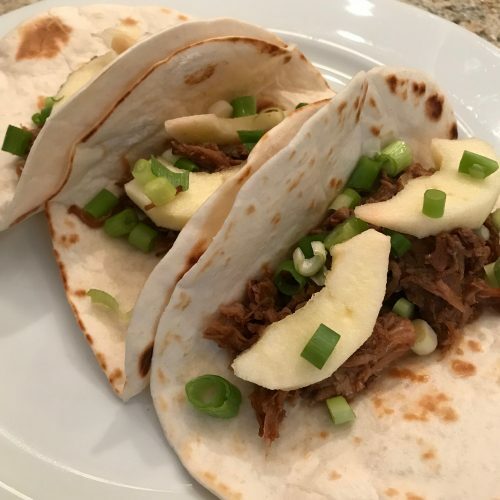 I made the apples a half hour before dinner, toasted the tortillas on a griddle, and sliced some green onions. That’s it. 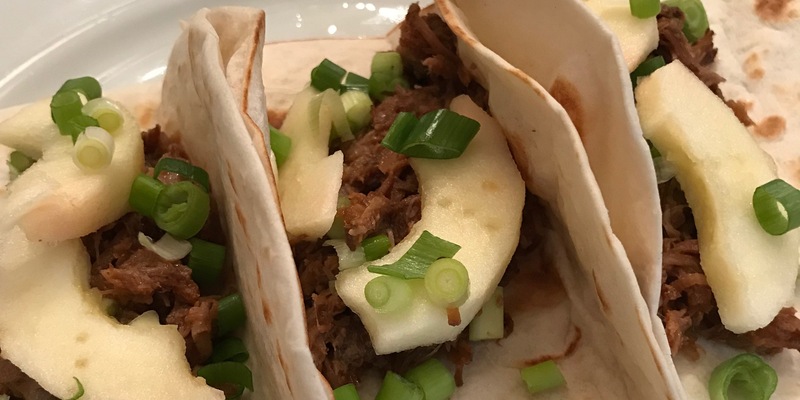 The apples really are the star of this taco. Pickling gives them a real zing that plays against the apples natural sweetness. I liked just snacking on them on their own. Using a crisp apple is important because they retained that crispness even in the pickling brine, think of the crunch of a good deli dill. Use a variety of apple that is crisp and on the sweet side. I used SweeTango. 1. Mix the vinegar, sugar, salt, and red pepper flakes together in a small plastic container until the sugar and salt have dissolved. 2. Peel, core, and slice the apple. You want the slices to be about 1/4″ at the widest point. 3. Put the apple slices in the vinegar mixture making sure they are all covered. 4. Put the lid on the container and refrigerate for about 30 minute. 1 year ago by Kat in Cooking | You can follow any responses to this entry through the RSS feed. You can leave a response, or trackback from your own site. These look really good. I can’t wait to hear about the rest of the dinner. I’ve never had pickled apples. I’ll have to give them a try. Congrats on your anniversary! I had never tried it either, it was a new treat.